PERFECT! Tastes good, makes me very alert but not "jittery". I tried Pilot Chews. They gave me that little boost I needed for the trip home after a day of work and an evening of flying. Did the trick... Recommend them to carry in the flight bag. Tell you something, came back from my ATPLs totally tired... The only thing i wanted was sleep... Had two tests in a row... Received the pilotchews just when came back, decided to take some, to test it - in fact i had to prepare for my next tests... SO! In 5 mins after i took it, i felt like a huge relief and my mood went UP! In about 20 mins i felt like dancing! ))) so decided to get to my books and start preparing... Was up from 7pm till 3am and got 93 and a 100 on me tests the next day! ))) highly recommend it! No idea what its made of, but it works great! And not only it keeps you awake, but also it powers up your brain! It works as new! No fatigue at all! )) Have a great day guys and fly safely! Wow. I read the ad and said, "Yeah, sure. I'll try some." I am glad I did. Although I am not flying right now, I do drive long distances and I do get sleepy. I tried Pilot Chews. Not only did I not get sleepy, It carried me through the evening. (My dance partners noticed.) I only ordered the small trial pack. Now I have to order more. Keep them coming. It was not a jolt of electricity but after flying for over three hours in 100 degree heat it sure gave me a lift. The effects were mild enough so that it did not keep me from getting to sleep that night. Tasted great and the little headache I had before I chewed one went away, better than an aspirin. Required Equipment from now on! I ferry airplanes and on long flights, you need something that will keep me alert and awake - and most importantly - not crash (no pun intended)! Pilotchews are the first product I have found that does exactly what it promises. I compare the taste to sweet tarts and I keep a supply in my plane, my flight bag, and my car. I also flight instruct parttime, and my students perform better when they have taken Pilotchews. Wow Im hooked on Pilot chews. They are the best ever. Got my box last Friday when I got home and took one on Sat and today, and worked awesome for me. Tomorrow will be a true test when I have to be at the airport at 415am to start the day. Thanks Pilot Chews. Dang, they taste good and work! I bought a box and Sun 'n Fun. Dang,,, they taste good and work! I was hoarding 5hr. 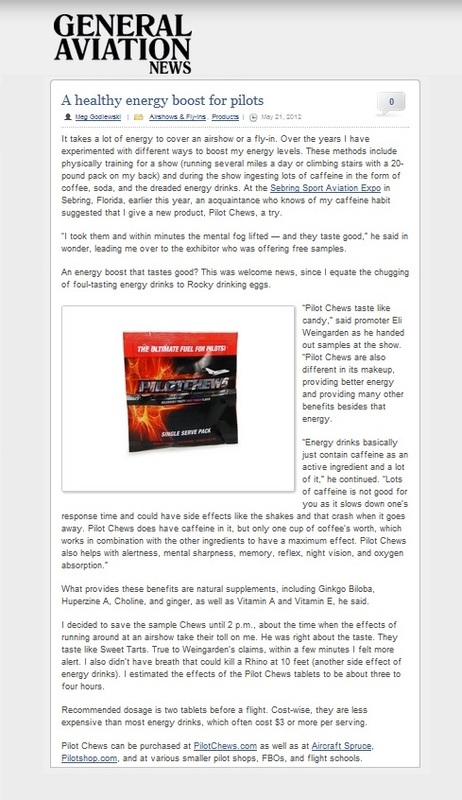 energy samples and pilot chews,,, and pilot chews came out on top. Thanks Pilot Chews! I tried the Pilot Chews during a night flight home after a long tiring day at the LSA Expo. I was used to usinig the 5 hour energy drinks which give a sudden "jolt" of energy but these chews came on gradual after layout 10 minutes. It was like someone turned on an extra set of lights in on the console. Everything was clear and vivid. The flight home was relaxing and comfortable with plenty of ground visibility during a starless flight home. I was wide awake all the way home, yet easily went to sleep at bed time without waiting hours for the effect to wear off. Tis product will be in my flight bag at all times from now on. Flying back and forth to the Sebring Light Sport Expo, fitting in-line with hundreds of planes is nothing short of demanding. As a pilot, this is what we love. It is nice to see PilotChews at the show. I'll be back each morning for more! It is a great addition to my gear bag! I was skeptical that this would do anything for me. In fact the first time I saw information about it I didn�t pay it much attention. Two weeks ago I saw a fellow pilot having some so I asked him about it. He claimed they worked well for him so that night I ordered a box. Just to mention I work a long day and don�t get more than 6 hours of sleep so I can�t say I am always as sharp as I should be. I received them a little over a week ago and been using them daily since. The taste is very good, very sweet and full of flavor. On an empty stomach it gives me a little of a rush feeling otherwise I don�t feel anything right away. For me it kicks in about 15-20 minutes after I take it. It makes me more alert, sharper, and my mind feels more alive. I didn�t see much memory difference in the first couple days but as of recent I do see my memory has improved. When I hear the ATIS I get it the first time, same thing with ground instruction and clearances. I will be ordering a few boxes on my next order! It lasted me 8 hours! Goodbye 5 hour energy hello Pilot Chews! I was exhausted and took them to just see what they do before I fly with them. Took them about 1pm and it wasnt till 9pm that I felt it lightly ease off. I know I was exhausted during that time but I felt like I could work all day and night no problem! It really sharpened me up! I am not a pilot but a school teacher. I figured I would give it a try anyway. After I had a dose of chews (which tasted great) I noticed a small immediate affect as well as a stronger one about a half-hour after consumption. The immediate affect was like a sudden refreshing feeling of alertness (like someone just poured a bucket of water on my head. ). Later on I felt a caffeine -like surge of energy ( Like a more rapid heart- rate, fully- awakened, sharper perception, clear-mindedness.) Lastly, the part I liked the most was the slow release and duration of the affects (5-6 hours). I didn't notice the immediate "crashing " feeling as I do with coffee. I was able to prepare and clean up from dinner (many days I'm too tired to do ), bake a bunch of cakes and make several desserts for an event coming up. I also cleaned up the entire mess ( it was big ). Normally at that time I crash (around 7:00p.m. ), but today I actually felt the peak of the pilot chews affect which slowly decreased after that. Now, I feel fine, just tired like I should at this time of night. I am thrilled that my cooking is done and my house is still clean! I cant wait to take them again tomorrow! I got a few samples from my FBO at TEB. I really liked this product. I found it to sharpen my mind and let me focus better. It was easier to multitask and I think my memory did actually work better. I look forward to my order coming. I was one of the lucky pilots to receive a sample of Pilot Chews to try. Let me start by saying they taste amazing! You want to take more just for the flavor! I had to fly a night flight one night and was exhausted. Figured it was a good time to test it. Well within a short time I was awake, sharp and alert. It wasnt just a caffeine buzz it was different. Better than 5 Hour Energy and I just felt on the top of my game. From the one flight and one dose I cant speak to all the benefits but I was definitely impressed and something I will be using on all my future flights!